My kids love the moon! They go through a moon obsession about once a month, not always when it's a full moon either. Sometimes they are worried because they can't find it. Sometimes they are shocked to see it still out in the morning. Sometimes they are happy to just stare at it in order to avoid going to bed. Because of this, I was in search of some good moon books. My search turned up something interesting, two extremely different Caldecott winners about the moon and here they are for your moon loving pleasure. I'm starting with this one because we have an owl at our house right now. For the last couple nights it has been using our roof as a hunting perch. So, we are not only moon crazy, but owl crazy too. This book is poetic, the words evoke stillness and make you want to whisper as you're reading. 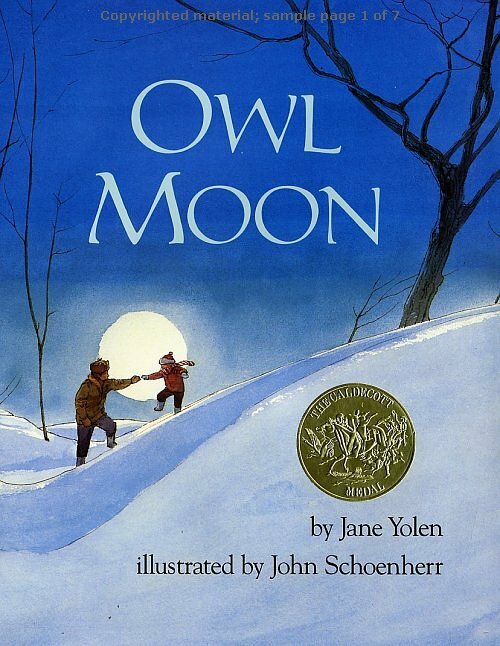 Jane Yolen is the author of the 'How Do Dinosaurs...' books, which I love. She works magic here too. There really is something hushing about the text. Written as if the main character is re-telling her adventure, the descriptions are vivid yet childlike. Combine the superb text with stark and crisp illustrations. The paintings are done in cool colors and they feel so cold and wintry. I love all the bare tree branches reaching from page to page. The illustrator, John Schoenherr, also used white space in a unique way, making it look like part of the snowy landscape. I think sometime as adults, we get so wrapped up in reading the book the we forget to enjoy the pictures-- how many times have you just read the words and gone to turn the page when your child stopped you so they could look at it a bit longer. When you look at the illustrations in this book you will feel like you are out owling alongside the characters. Remember how I love Kevin Henkes? Well this is another side of him, which is equally intriguing, but totally different from what I talked about in the other post. High contrast, expressive illustrations and a straightforward story line make this book a fun read for both preschoolers and early elementary aged kids. 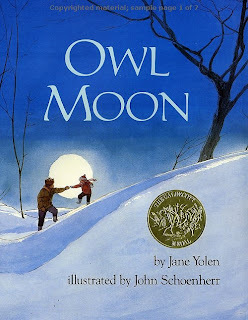 I especially love this one in juxtaposition with Owl Moon (yes, today the blog goes all vocaby on you-- well except for the fact that I just made up a word-- the parentheses will not be vocaby I guess.) Just look at the two cover illustrations, totally different. If you have a chance, check this book out along with Owl Moon. 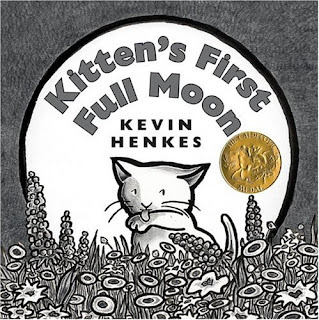 I have no idea how those Caldecott people decide what type of book will win each year. I wonder if they try to choose something totally different every time. Anyway, the thick black and white drawings and minimal text add to the fun of the story. I also like the fact that even though the drawings are simple, Kitten's expressions and intentions are easy to discern. Little ones will enjoy watching kitten's plotting and sympathize with her defeats. Happy moon watching and happy reading!